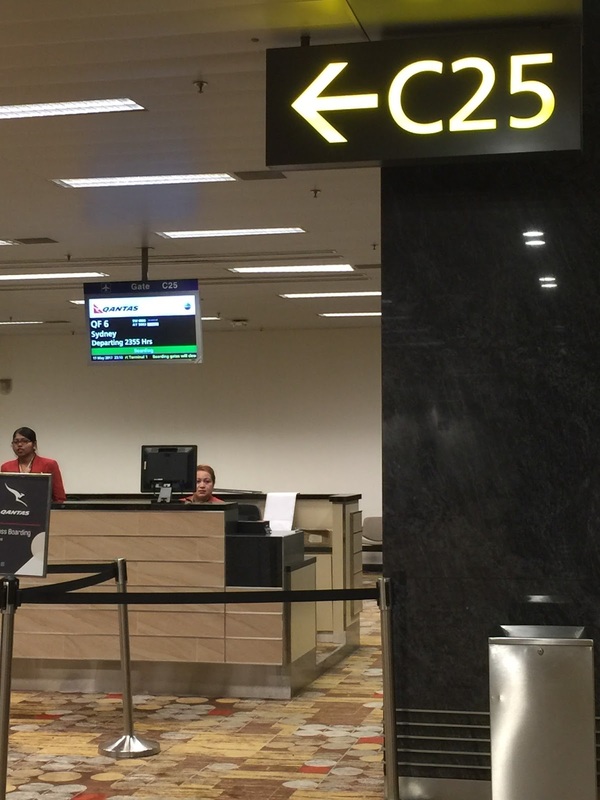 The check-in counter for Qantas is located at Row 5 in Terminal 1 of Singapore Changi Airport. 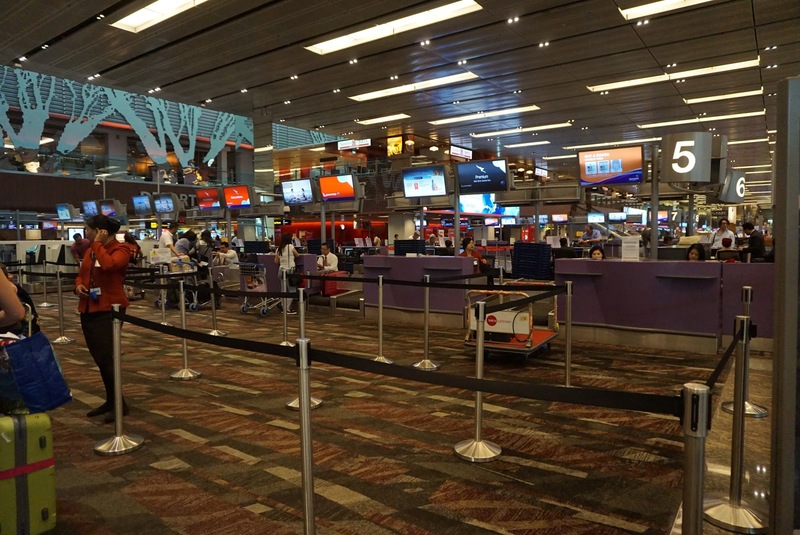 For passengers who arrived earlier than the check-in timing, they can proceed to the early check-in counters just behind row 5. 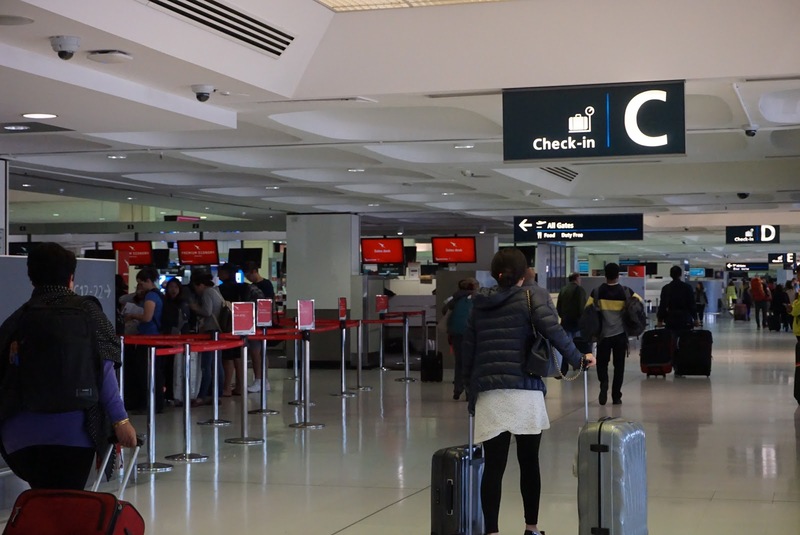 Despite being 6 hours early, we were able to check-in at the Qantas counters without the need to use the early check-in facilities in the airport. 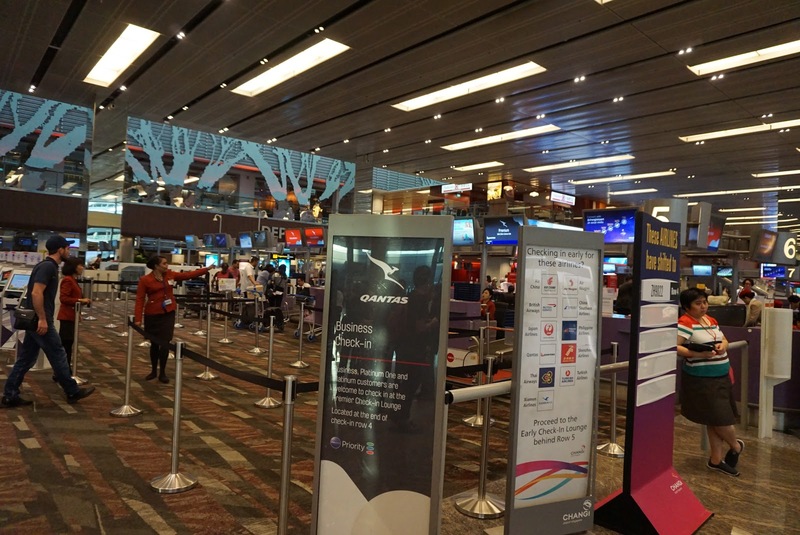 There was no queue at the time of our check-in, perhaps due to the early timing we have arrived at the airport. Checking-in was a breeze with the agent handling our check-in fast and swift. After handling taking our luggages, the agent handed our boarding pass and reminded us of the departure gate and the time we need to be there. Clearing Singapore Customs is a breeze as well. As citizens of Singapore and citizens of selected countries, we can use the electronic lanes. 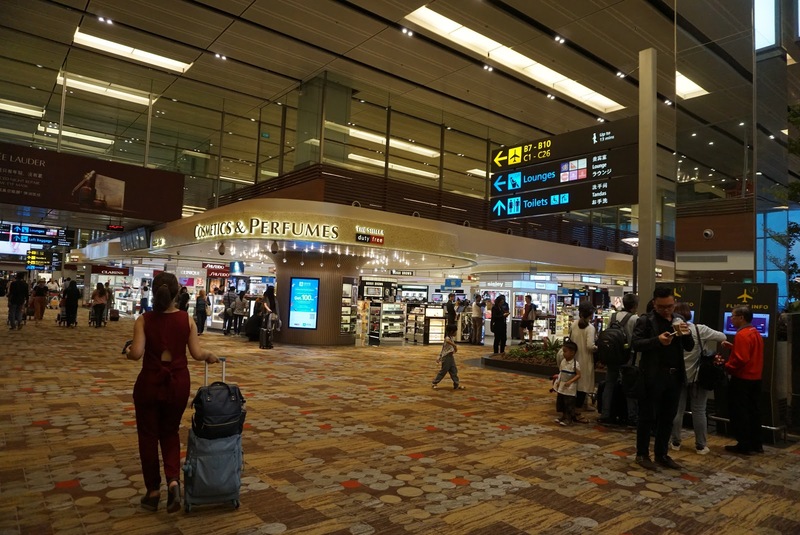 The airside of Singapore Changi Airport is always lively regardless the time of the day. 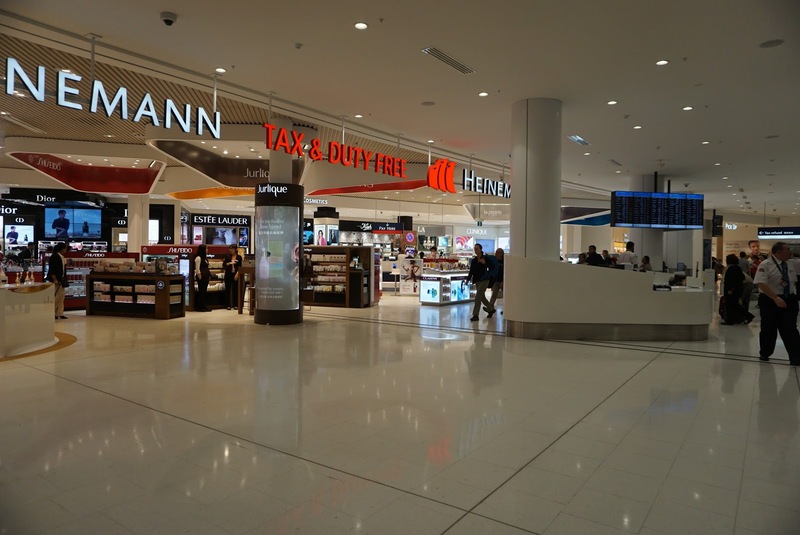 There are no lack of duty free shoppings from luxury brands to perfumes and cosmetics to electronics. We boarded first before Business Class passengers as we have a baby flying together with us. 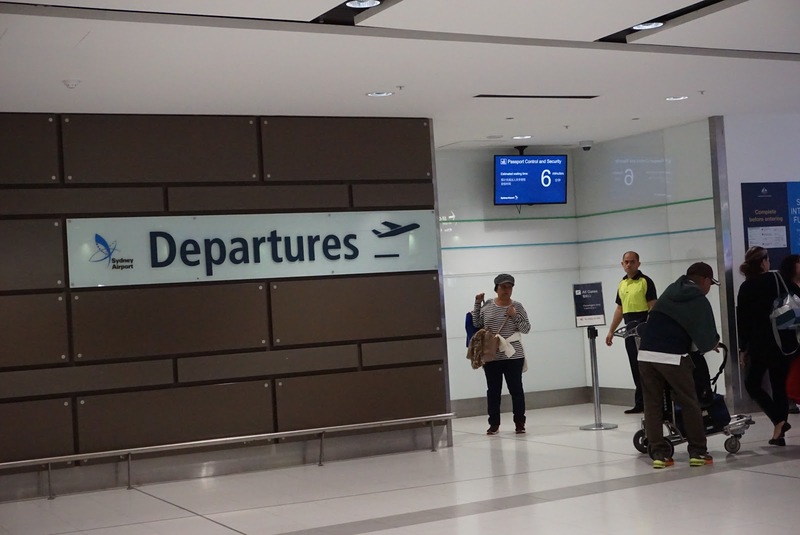 Qantas has a dedicated counter in Terminal 1 of Sydney Airport. 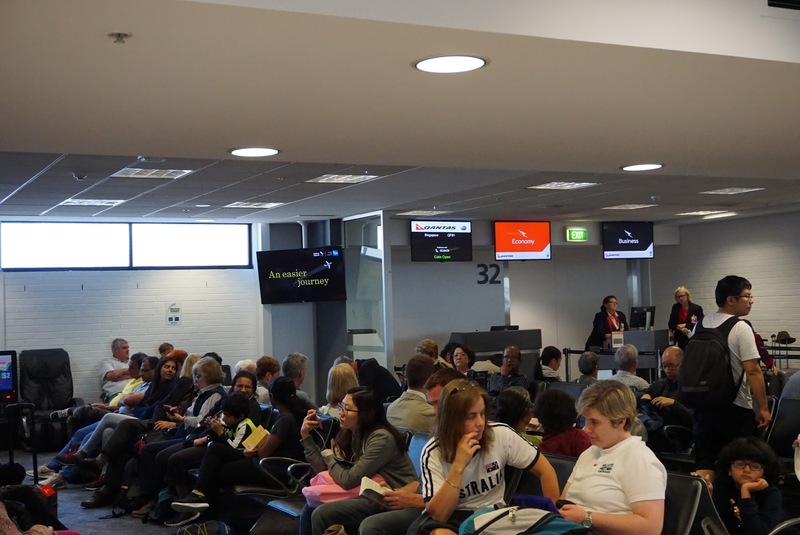 The counters are located in Row C of the Terminal. 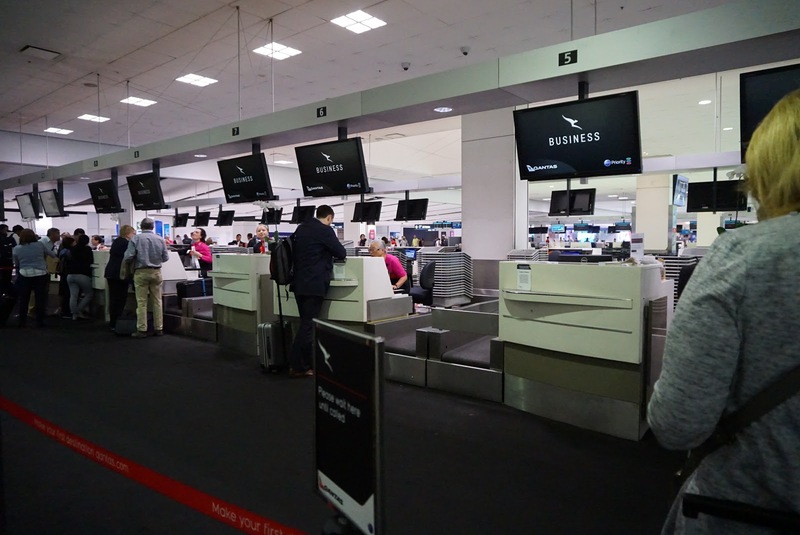 Qantas has separate counters for Economy, Business and First Class passengers. The queue in Economy Class is rather long, before we reach the queue, a ground staff was around to direct human traffic. Upon seeing that we have a stroller in tow, she diverted us to the Business Class check-in queue, which was a lot shorter. We were next in line to be served. The agent at the Business Class check-in counter is not exactly the friendliest person around. There were no smiles, no greetings, as though we owed her a living. Despite that, she was rather efficient. We were given our boarding passes after she has checked-in our luggage. Clearing the custom was fast as well due to the electronic clearance gates that we were able to use. 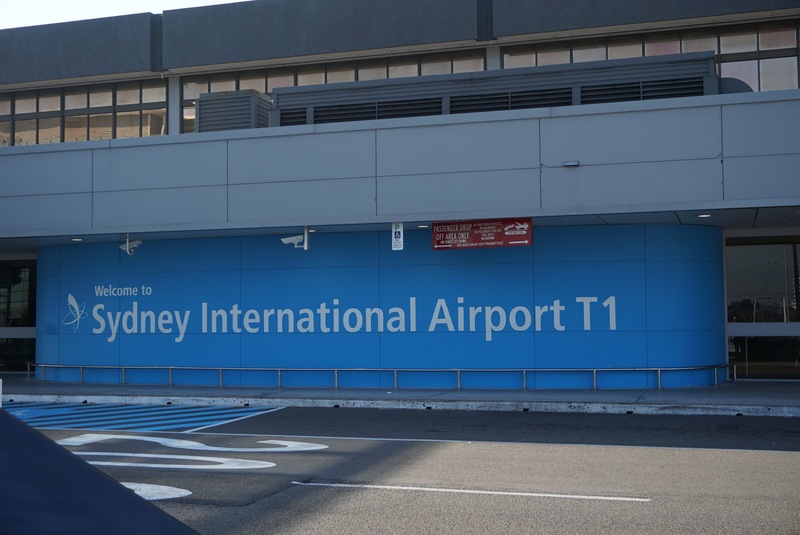 We were at airside within minutes of clearing security and custom. 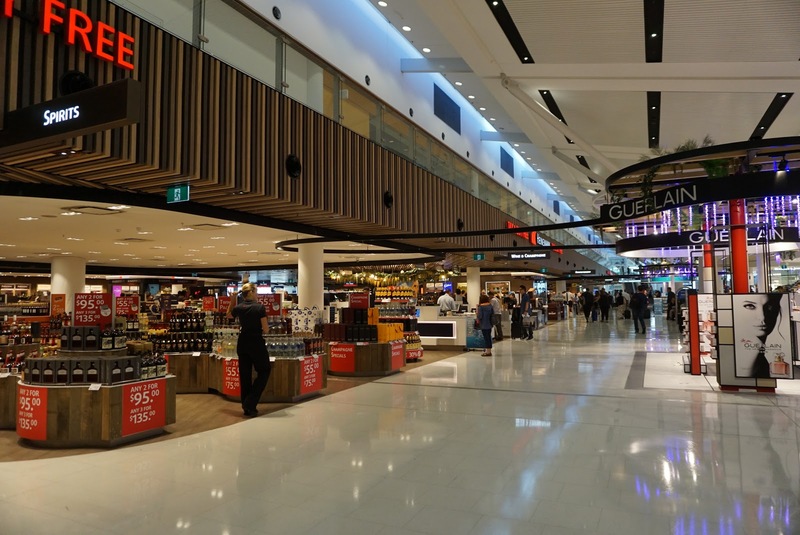 Sydney Airport has a lot of shopping options, mostly selling Australian made products. There are also cafes and eateries around in the airside as well as opposite the departure gates. As with outbound flight, we were also boarded before Business Class passengers. 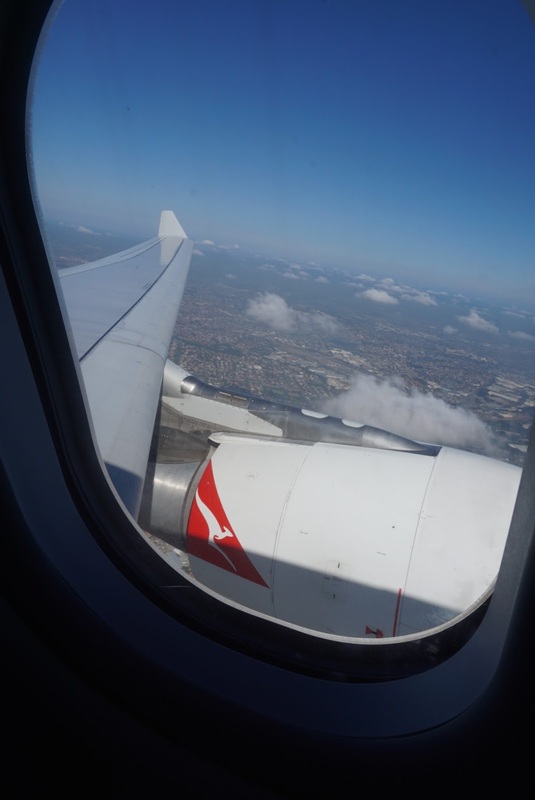 Qantas uses A330-200 to ply between Singapore and Sydney, however we got 2 different variations of the aircraft. 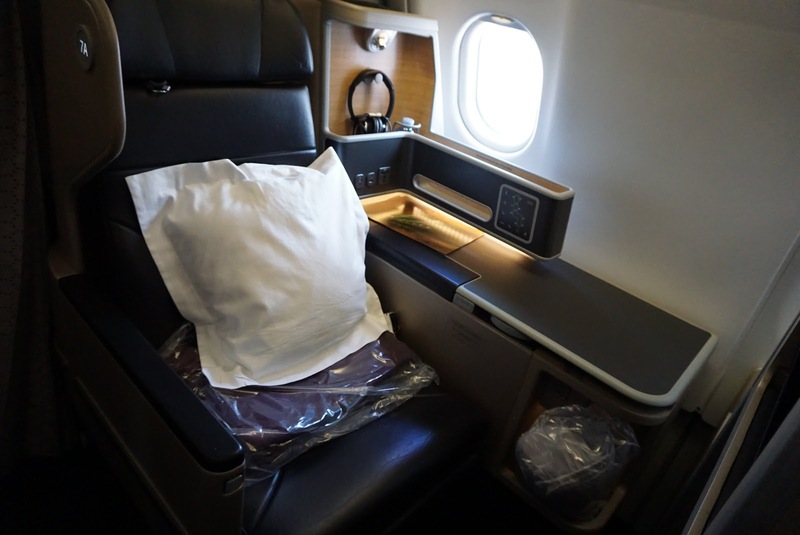 Both aircrafts has 2 different cabins, Business Class and Economy Class. 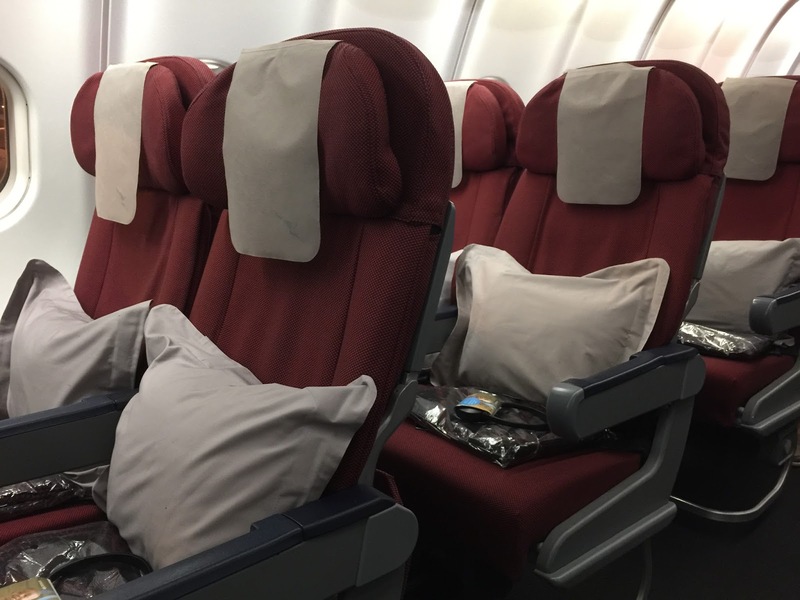 Despite the different seats, both aircrafts has white cabin with red seats. 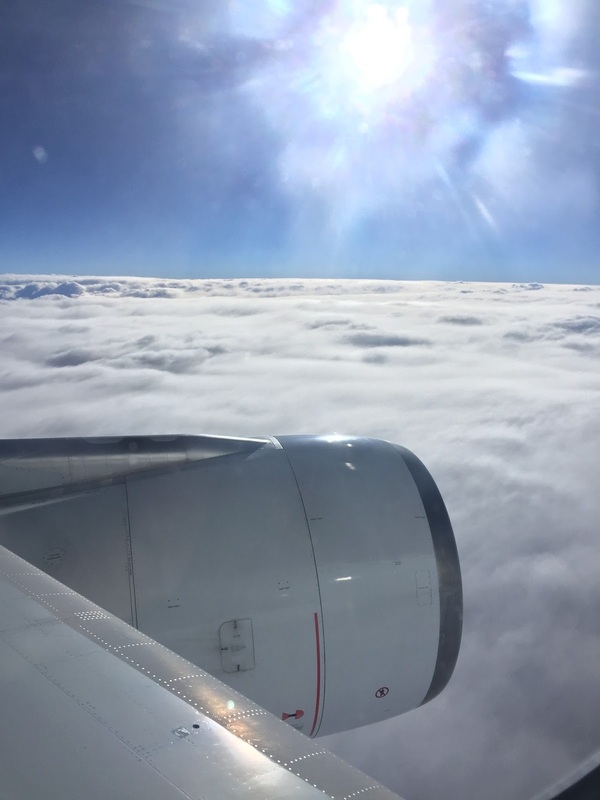 The choice of white colour makes the Economy Class cabin look fresh and big. The Economy Class cabin is organised in 2-4-2 for both variations of the aircraft. 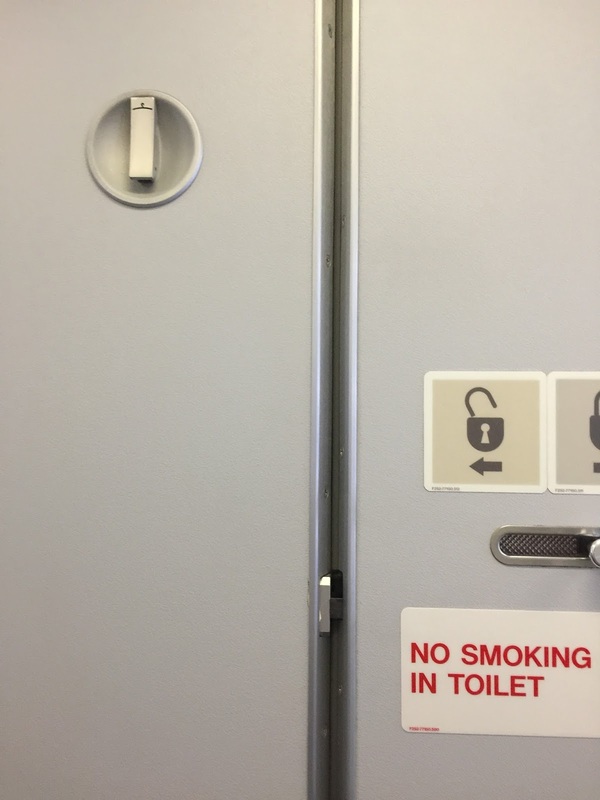 Lavatory onboard both variations of aircrafts are the same. They are of a decent size but has very limited amenities. 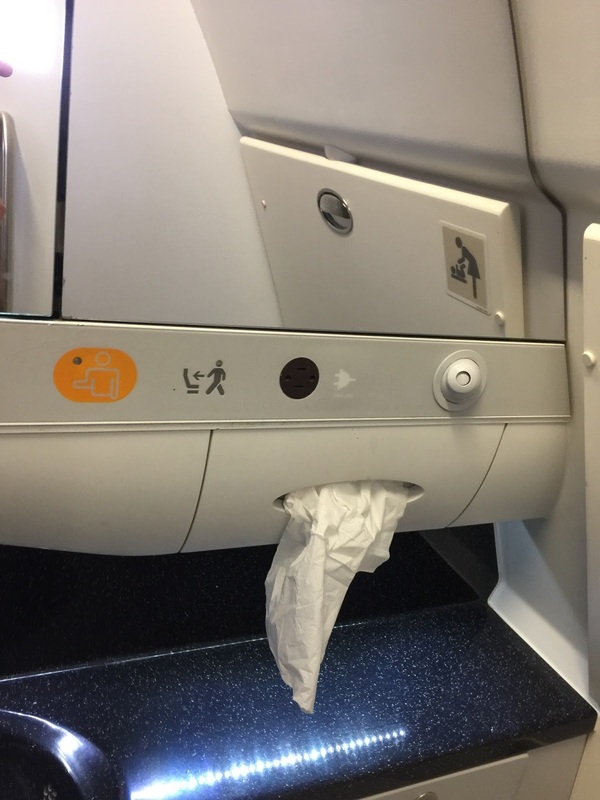 There is only hand soap and tissues in the lavatory. 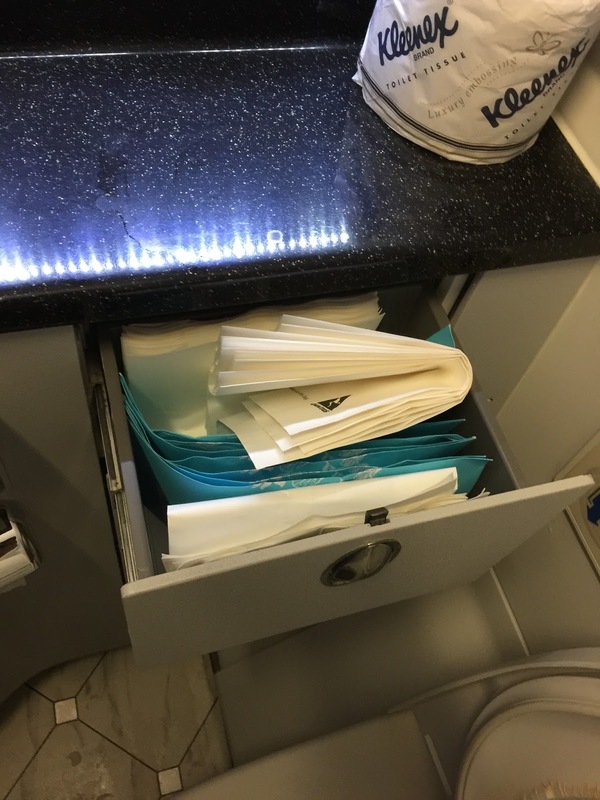 No other amenities are present in the lavatory despite flying out on an overnight flight, no dental kits were offered or found in the lavatories. 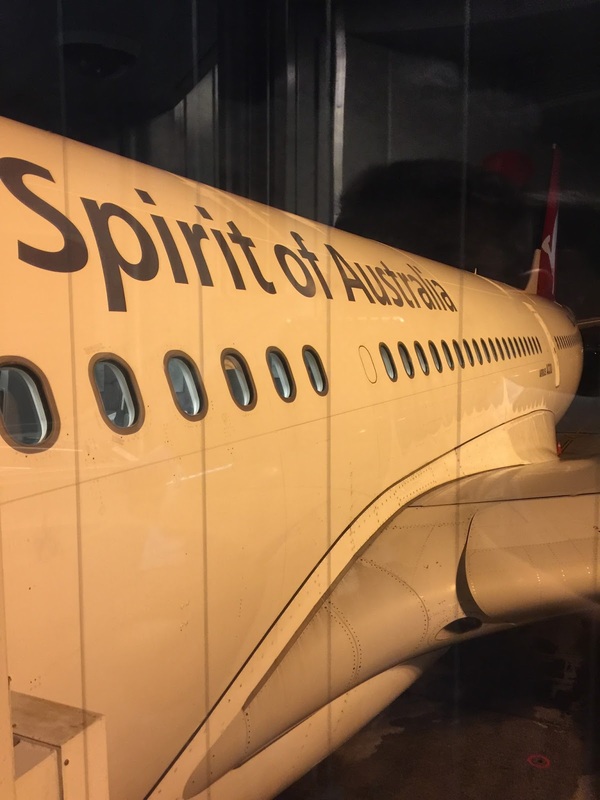 The A330-200 that we flew from Singapore to Sydney seem to be the older version. 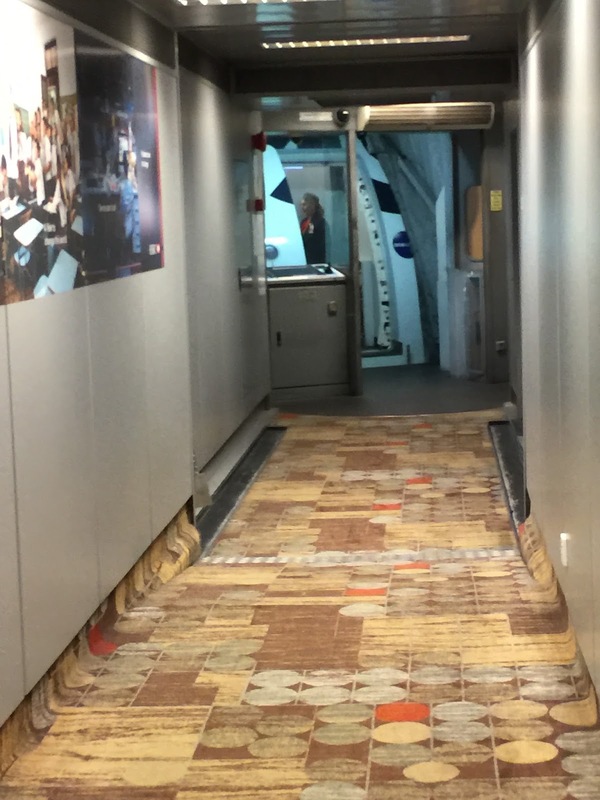 There are signs of the aircraft being aging. 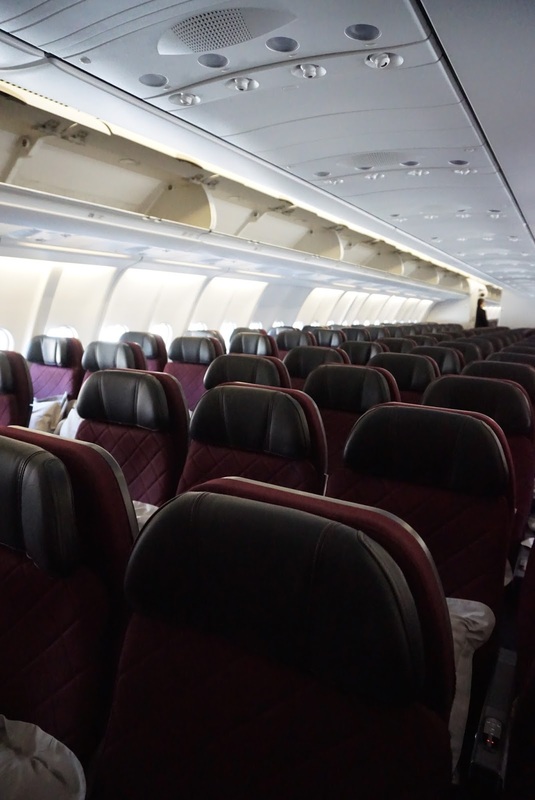 The seats on this variation of Qantas A330-200 has a pitch of 31″ and width of 17.2″. 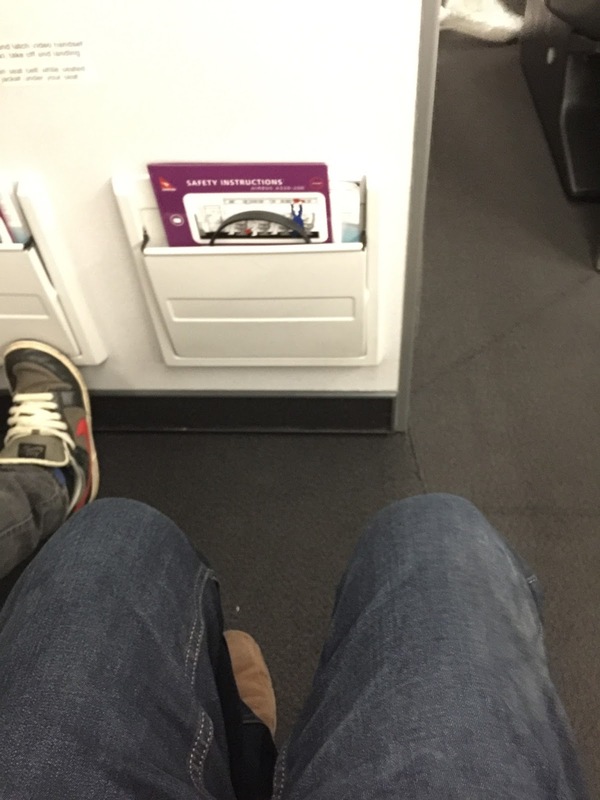 The seats at the bulkhead is far more generous measuring about 60″. 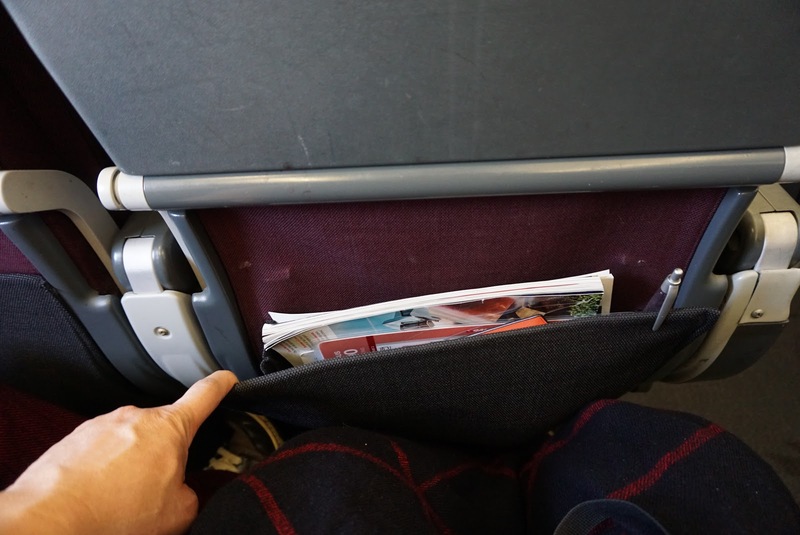 As we were seated in the bulkhead seats, there are pockets on the bulkhead to store inflight magazines and reading materials. However these pockets are unable to store items such as cameras. 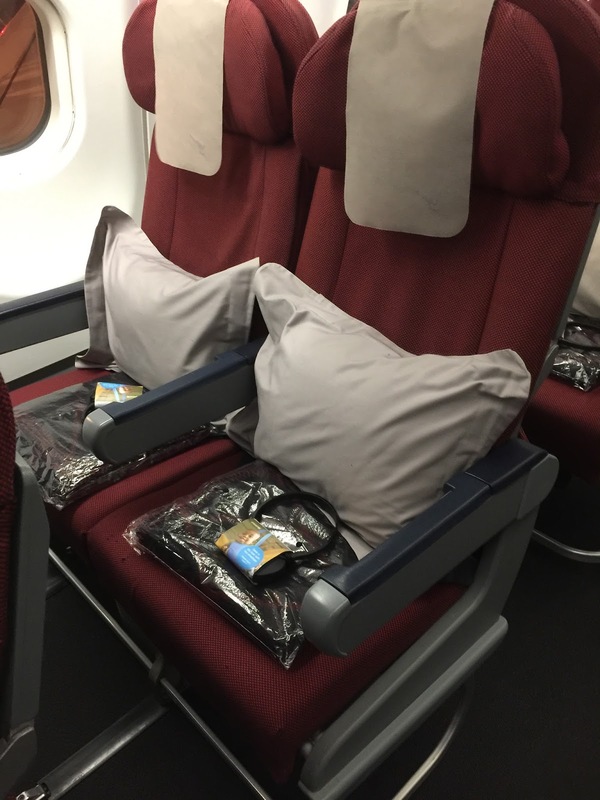 The Economy Class seats are rather simple and does not come with USB or power plugs. 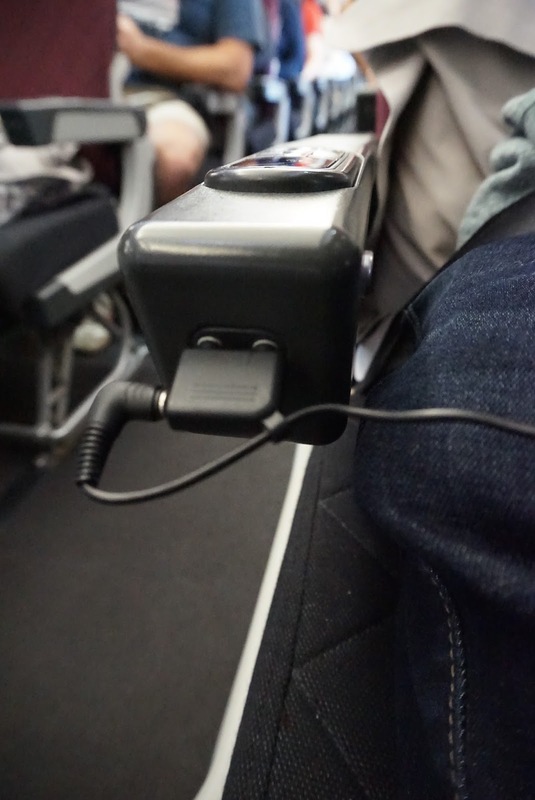 The recline button is found on the side of the armrest together with the headphone jacks. 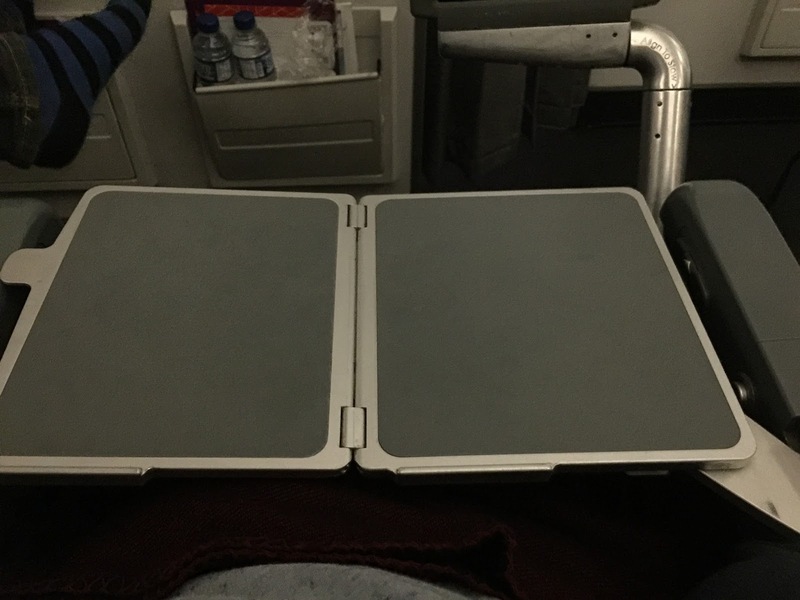 As with most Bulkhead seats, the tray tables are stored in the armrest of the seat. The seats are rather uncomfortable and I did not manage to get a good night rest. 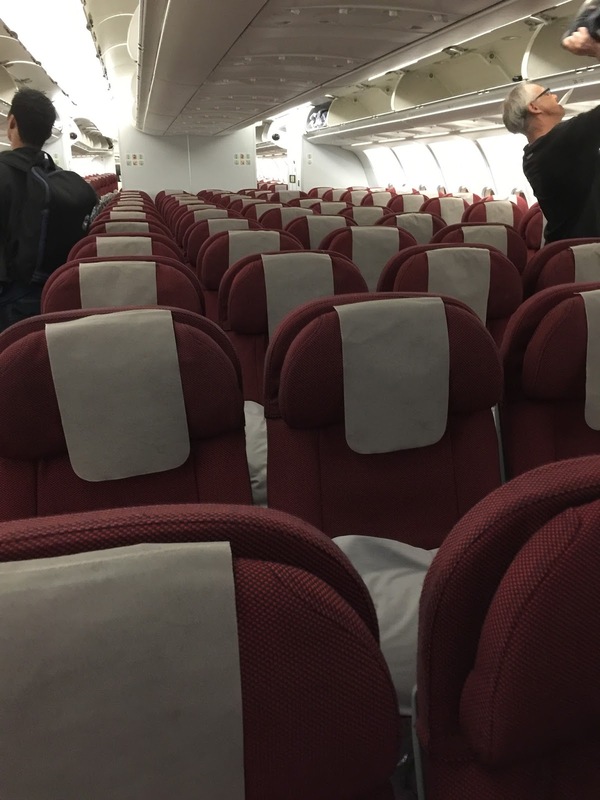 The A330-200 that we flew from Sydney to Singapore looks like it has been refurbished. 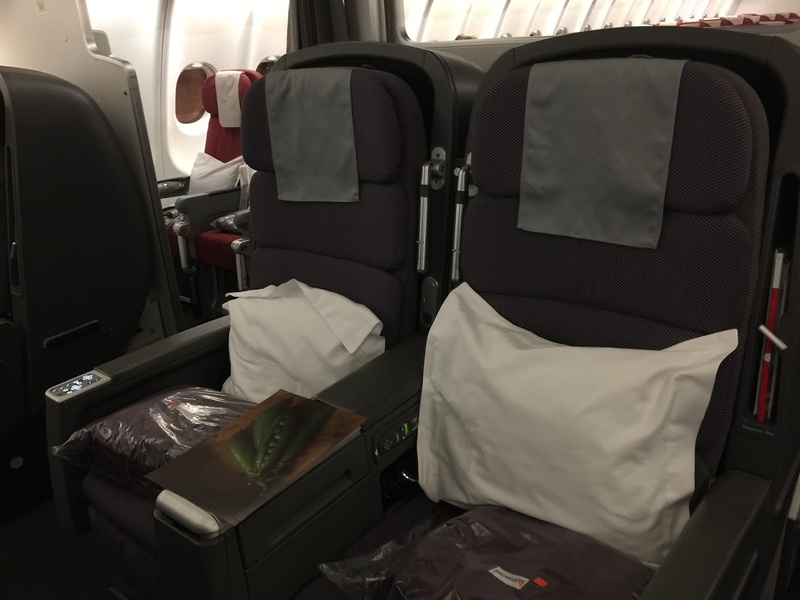 The seats on this variation of Qantas A330-200 has a pitch of 31″ and is slightly wider at 17.5″. 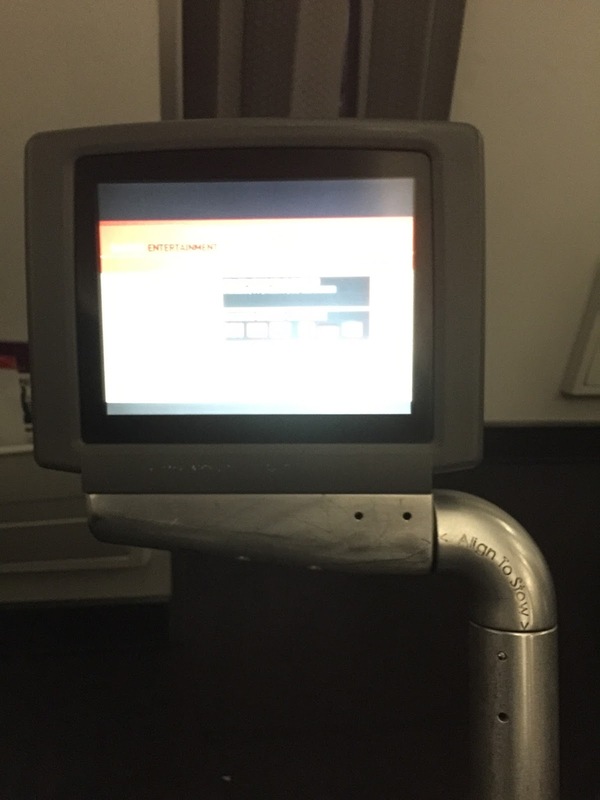 Unlike the previous variation, this version of A330-200 has a USB port located to the right of the IFE screen. 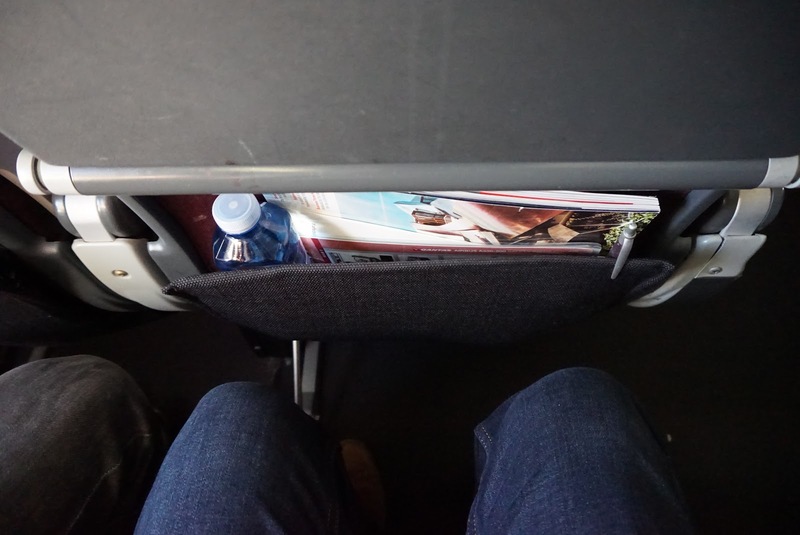 The legroom feels a little cramp, especially so when the passenger in front reclines his/her seat. 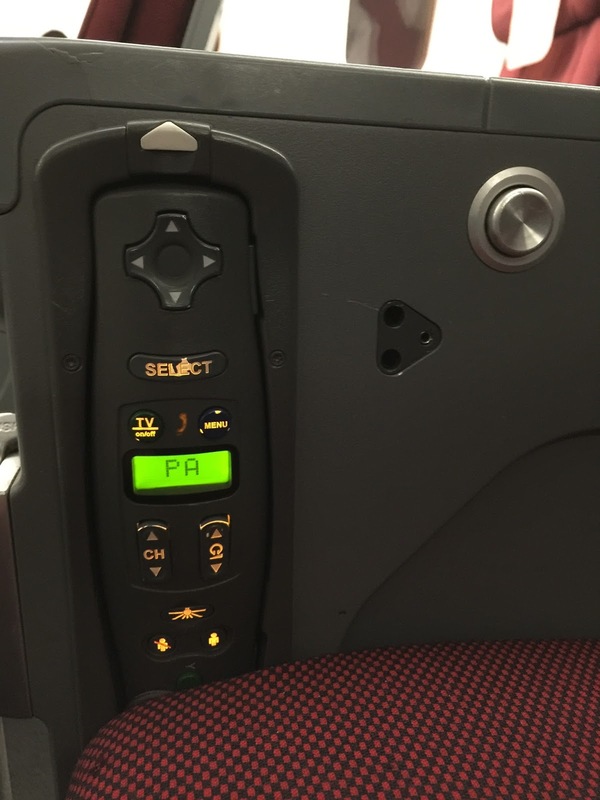 The IFE controller is fixed on the right armrest, which the placement is a tad counter intuitive. Many a times, I accidentally pressed on the IFE controller of my friend who is sitting next to me. The single layer seat pocket on the back of the front seat is rather standard and cannot store bulkier items such as a camera. 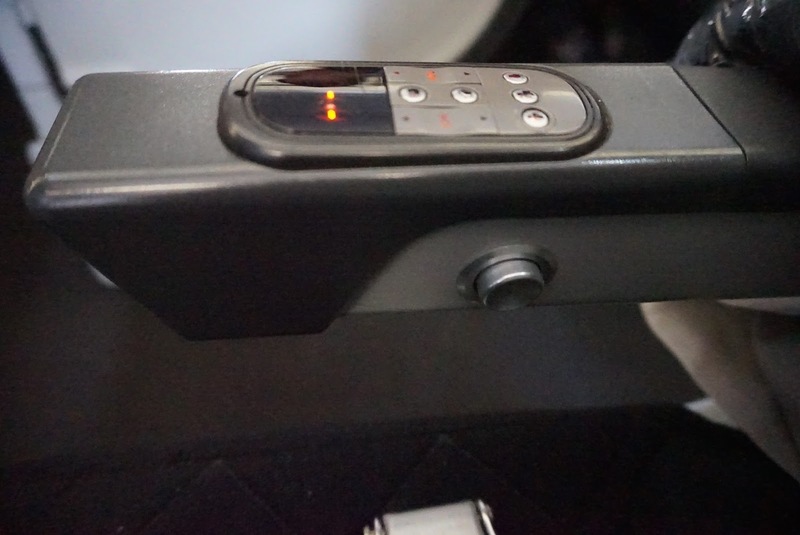 As with the previous variation, the seat recline button and headphone jacks are located on the armrest. As with the previous flight, seats are rather uncomfortable and gave me a backache after the 8 hour flight. As mentioned earlier, this is an old aircraft. 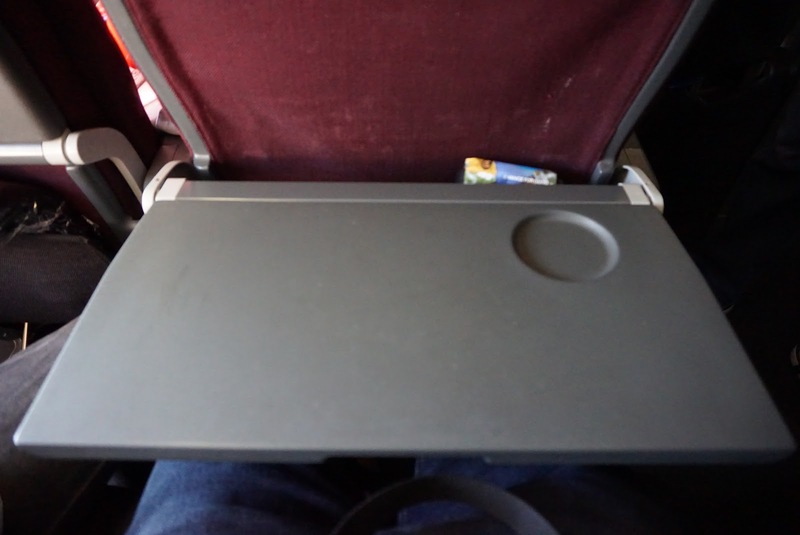 The In-Flight Entertainment system has a mere 8″ screen. 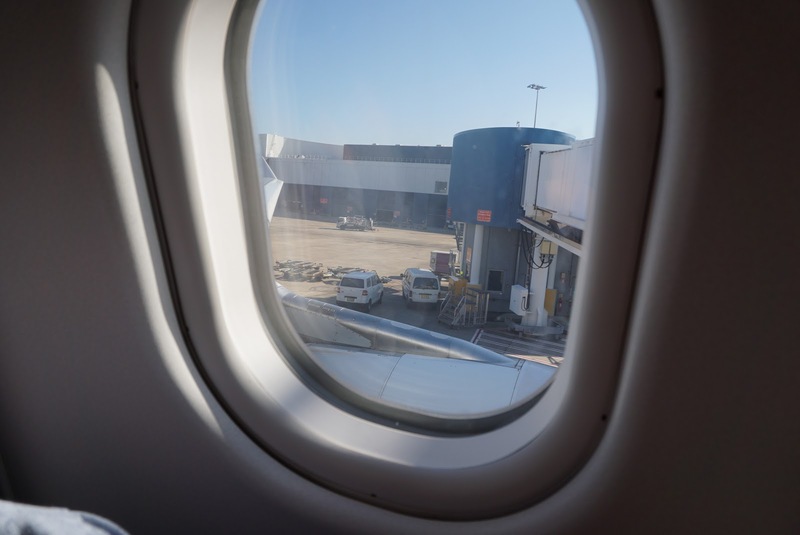 As we were sitted at the bulkhead, the IFE screen is stowed below the seat and cannot be used during take-offs and landings. The controller for the IFE seem dated and is stored on the inner side panel of the seat. The screen on these seats are not touch screen, control of the movies to watch have to be made via the controller. The IFE system on this variation of the A330-200 seem to lag. 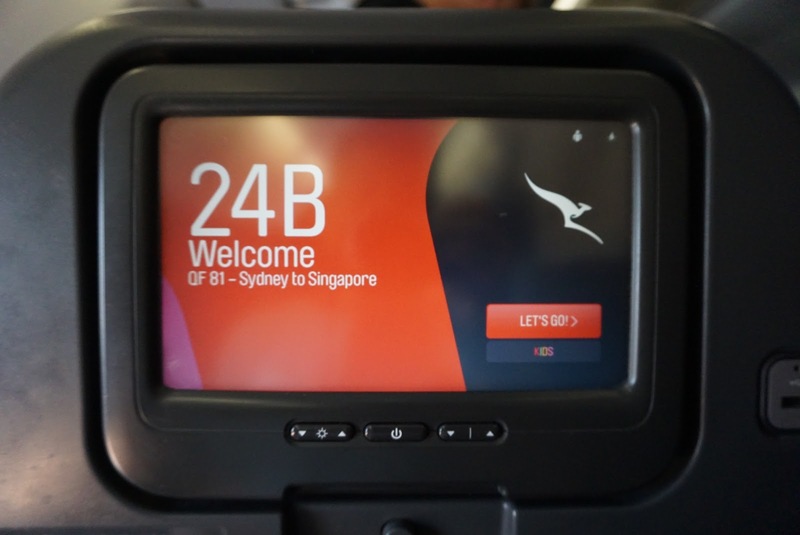 Nonetheless, Qantas does offer a huge selection of entertain options on their IFE system. 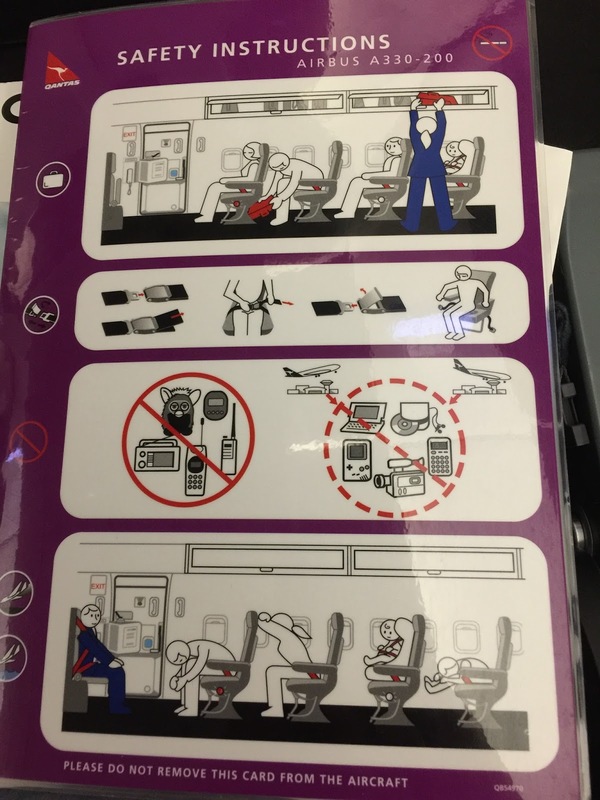 There are the latest Hollywood Blockbuster as well as tons of movies and TV shows to keep passengers entertained. The Headphone quality is a tad bad, I had to adjust the headphones a few times to get sound on both sides of the headphone. 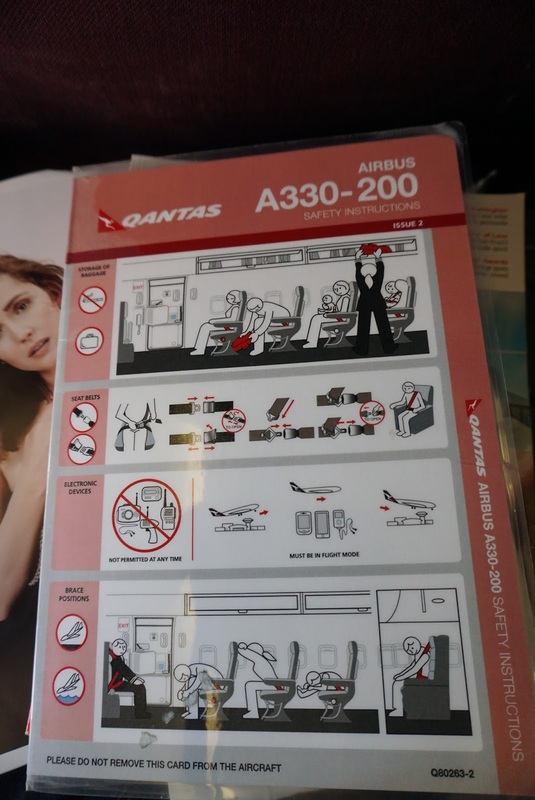 As this variation of the Qantas A330-200 is newer, it has a 10.5″ IFE screen. 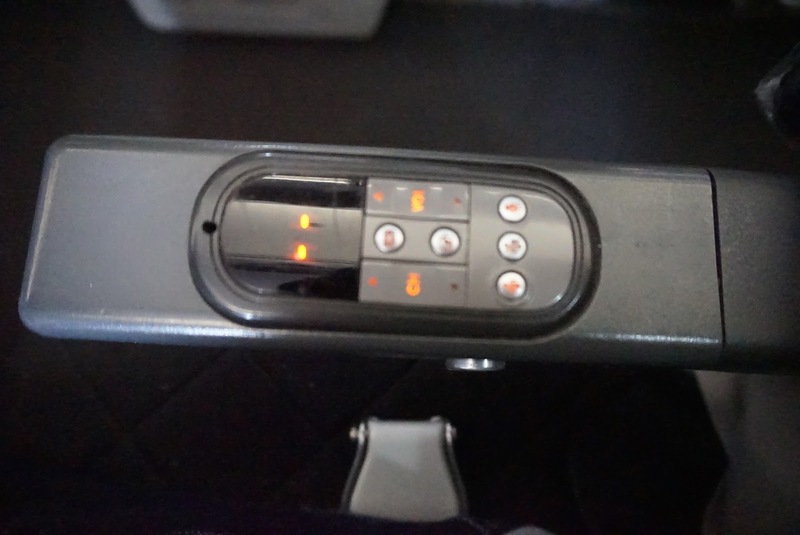 The controller is fixed on the armrest of the seat and does not control the channels to be watched on the IFE screen except for the volume. Control for the shows are done directly on the touch screen IFE, which is quite sensitive. Brightness of the screen as well as on/off switch are found under the IFE screen itself. 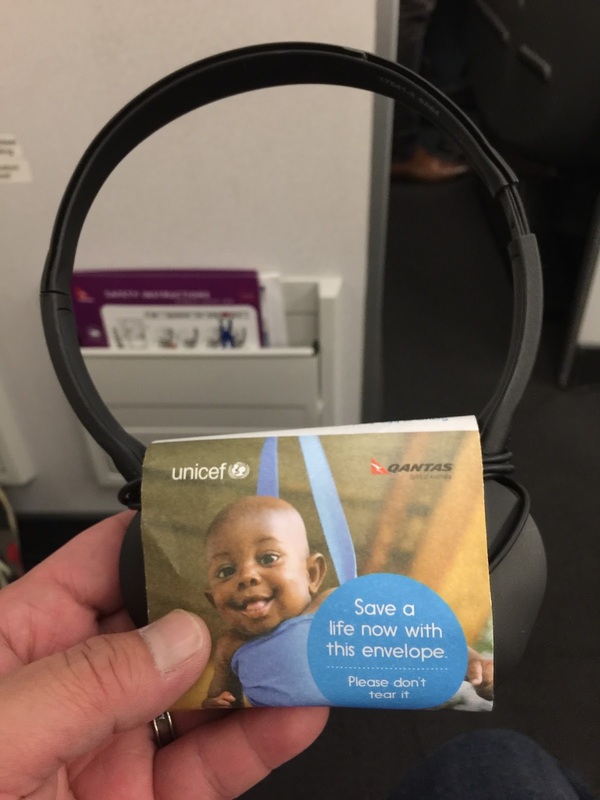 However as with the previous variation, the headphones provided suffer from constant poor connection issues. 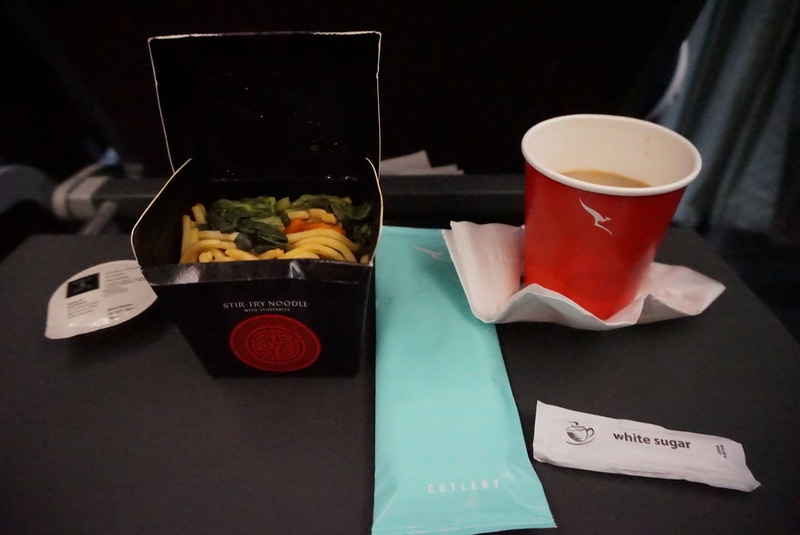 There are 2 meals being served onboard this leg of the flight. 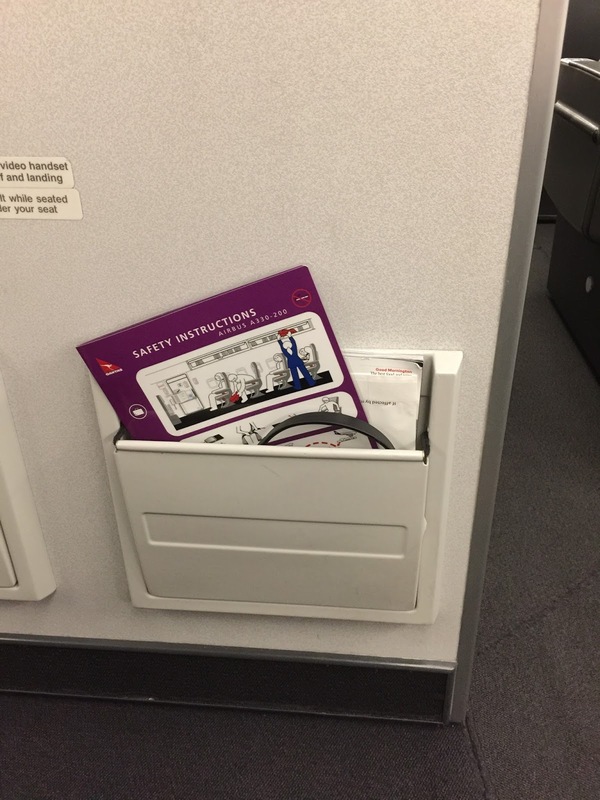 Shortly after the seat belt signs are turned off, the flight attendants went around passing passengers menus. Night snack is served shortly after the menus were distributed. No options are given for the night snack, however when we got the night snack, it is different from that stated in the menu. However I thought it is a good idea to serve wraps as night snack, which will not make one feel too full, and yet not allow one to go to sleep hungry in the night. Options were given for breakfast, we were offered either the omelette or fruits for breakfast together with coffee or tea. The food served is decent and does the purpose of filling one’s stomach. 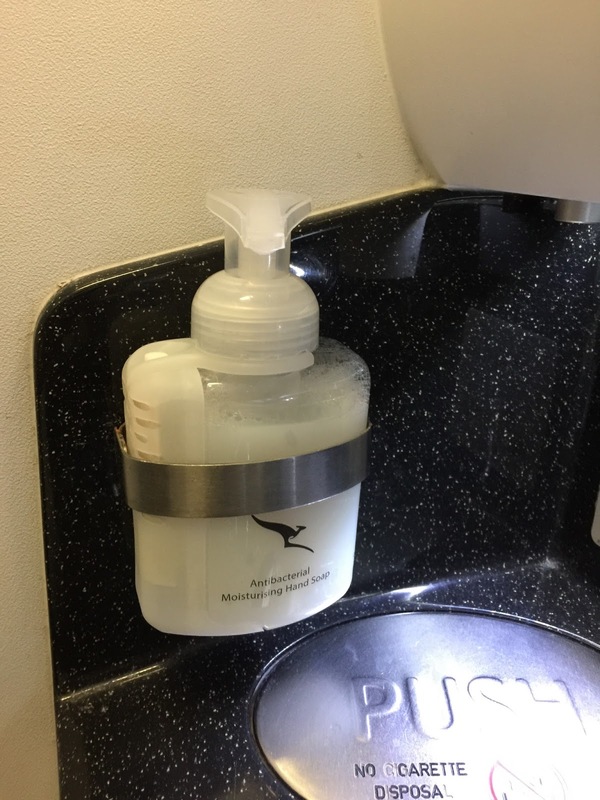 Qantas already placed a bottle of water in the seat pocket at the time we board the aircraft, which is not done on most other airlines. 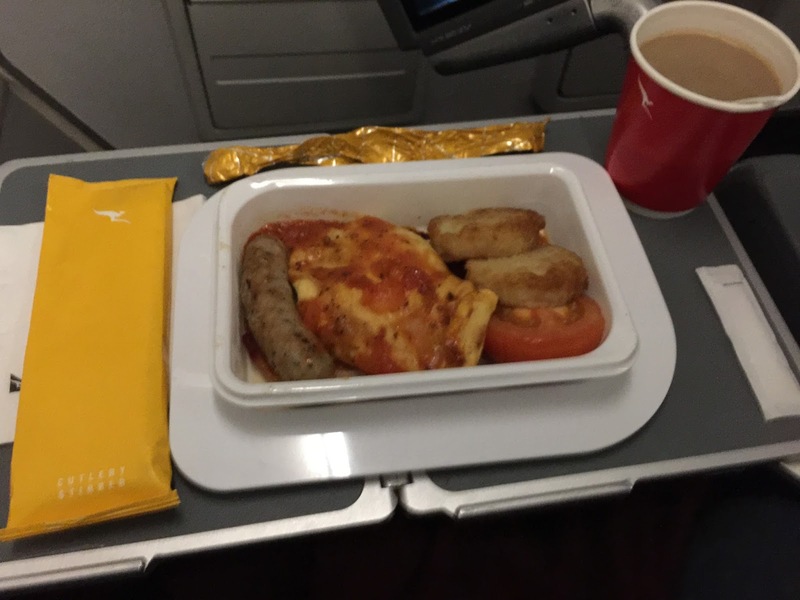 As with the previous leg, 2 meals are also served on this leg of the flight. 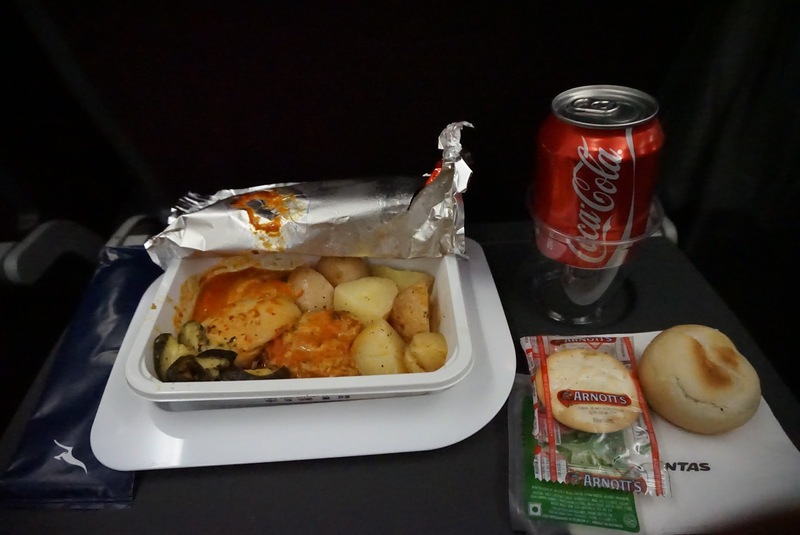 As the flight was delayed, flight attendants went around distributing menus prior to take-off. 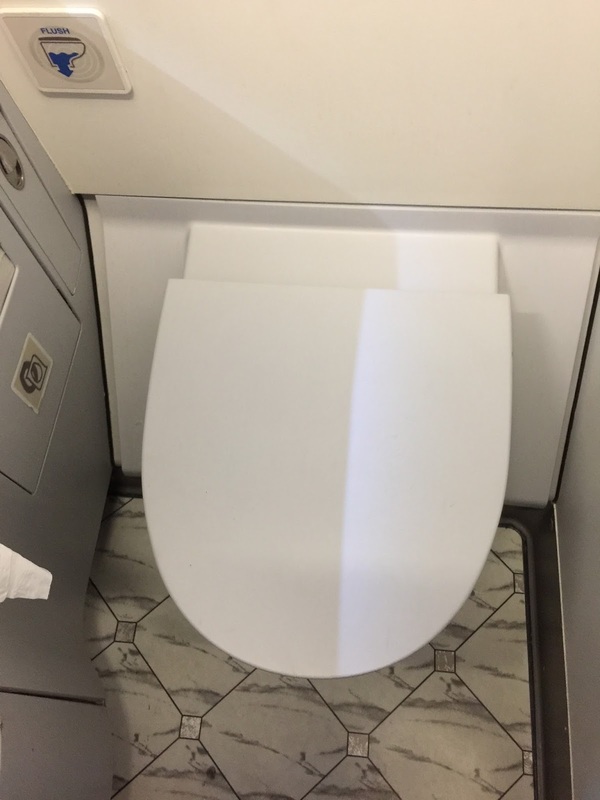 Lunch was served shortly after taking-off and we were given 3 options to choose from. I opted for the Peri Peri chicken, which is rather dry and the portion served was a tad too small. The wedges are not fried but boiled and the sauce is bland. Another meal is served 1 hour prior to arrival. There are no options for this meal. We were given vegetarian Chinese stir fried noodles. The noodles itself taste decent, the sauce that is given is delicious. 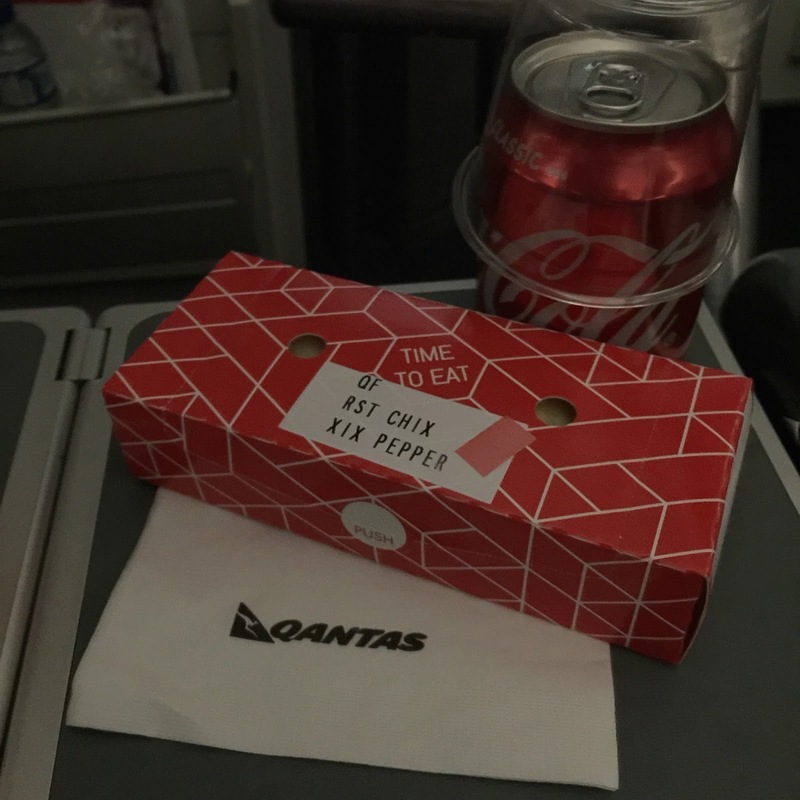 Service was a mix onboard Qantas and feels pretty much personality driven. 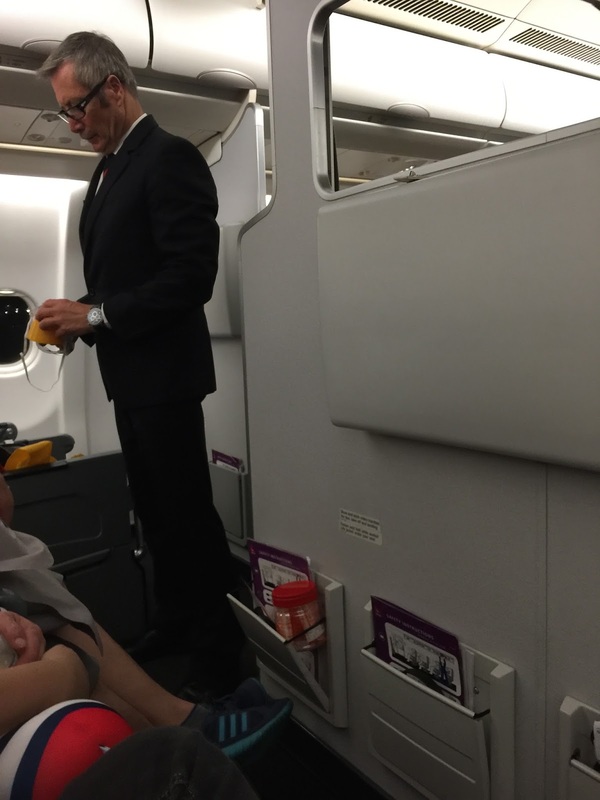 While most of the flight attendants are friendly, there are some whom seem not too willing to serve. 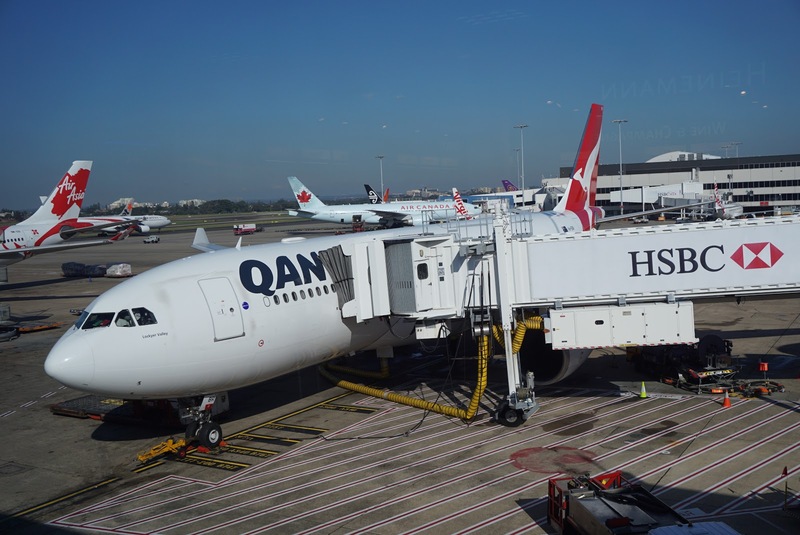 On the SIN-SYD flight, we asked for help from one of the attendants from Business Class. He came over unwillingly and chilled us off for asking for help. Guess he thinks helping Economy Class passengers is an insult to him. 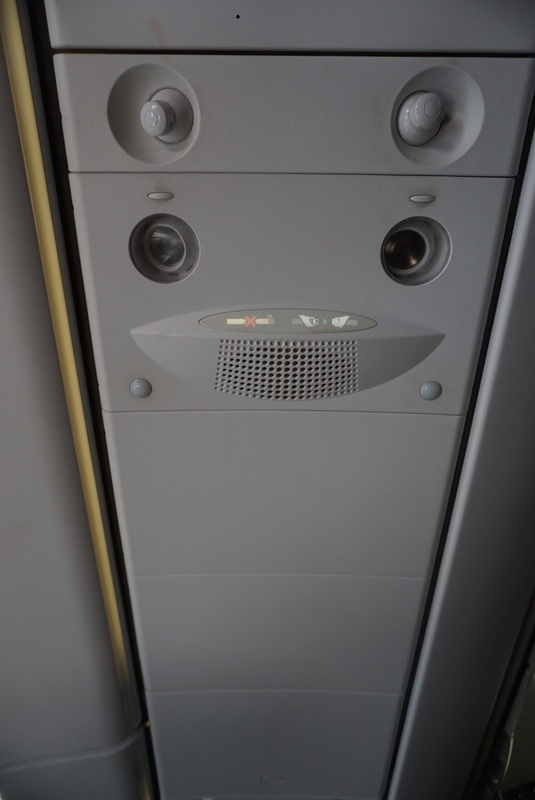 Other than him, the rest of the crew on Economy Class is a lot more friendlier. 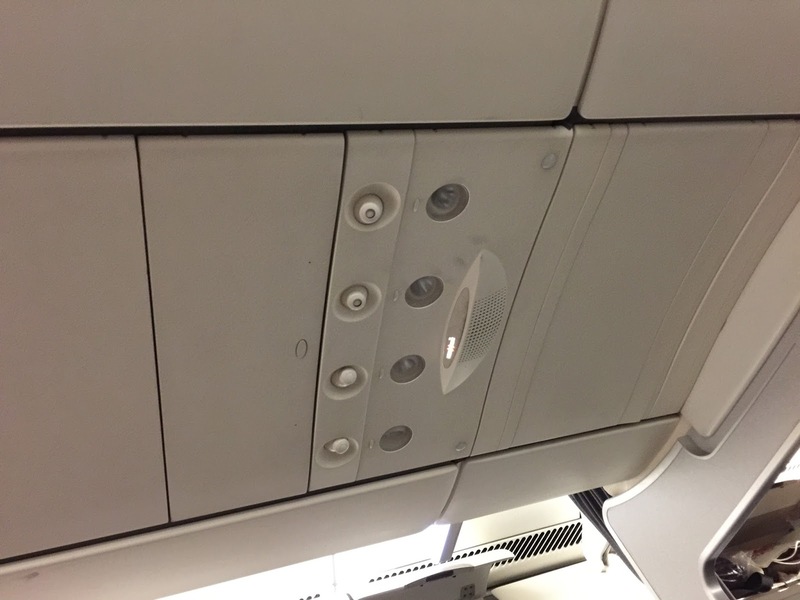 They were seen patrolling the cabin to check on passengers and were very responsive to call buttons. 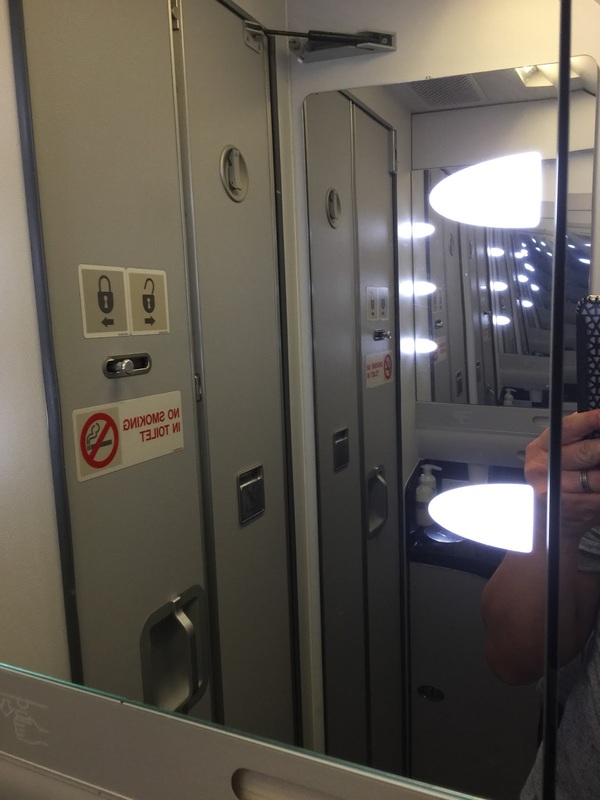 As the flight was relatively empty, one of the attendants, while conducting her night patrol of the cabin, approached me and notified me that I am free to occupy the 2 empty seats by the window to make myself more comfortable. 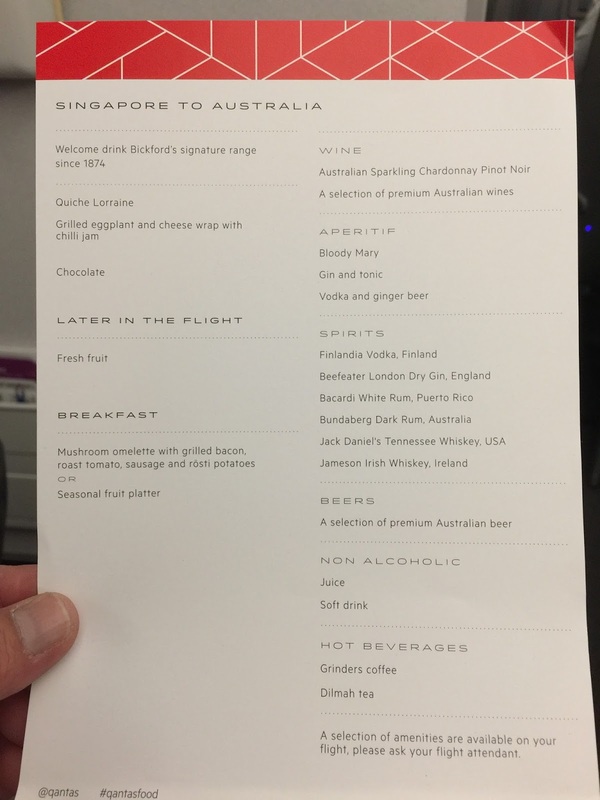 Crews are certainly more friendly on the SYD-SIN flight. Attendants are always ready to help and constantly patrol the cabin to ensure passengers are well taken care of. Attendants voluntarily offered me drinks upon seeing my cup is empty and quickly return with a can of coke. As I felt hungry in the middle of the flight, I asked one of the attendants if there are buns left. Despite having no buns left, the flight attendants offered alternatives and brought me some nuts instead of just saying no. 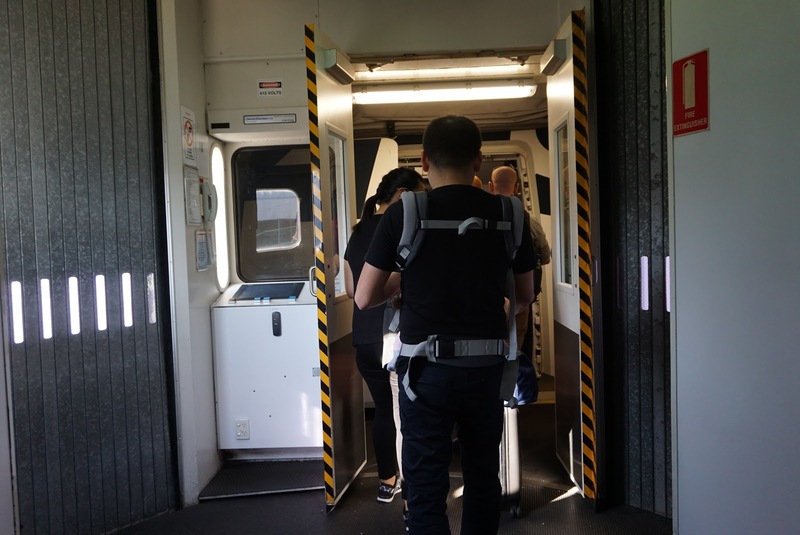 Attendants are seen smiling and helping passengers during boarding with storing their hand-carries on the overhead compartment. 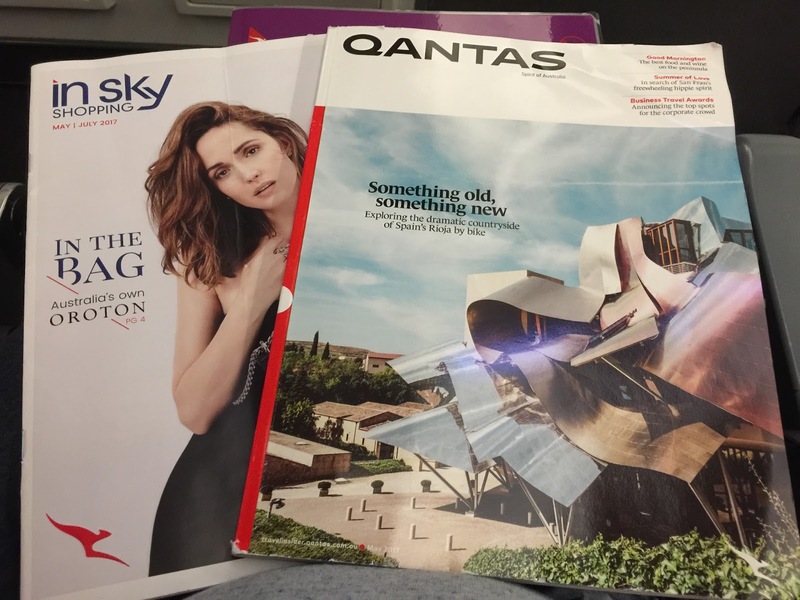 Qantas feels like they are operating on a budget concept. 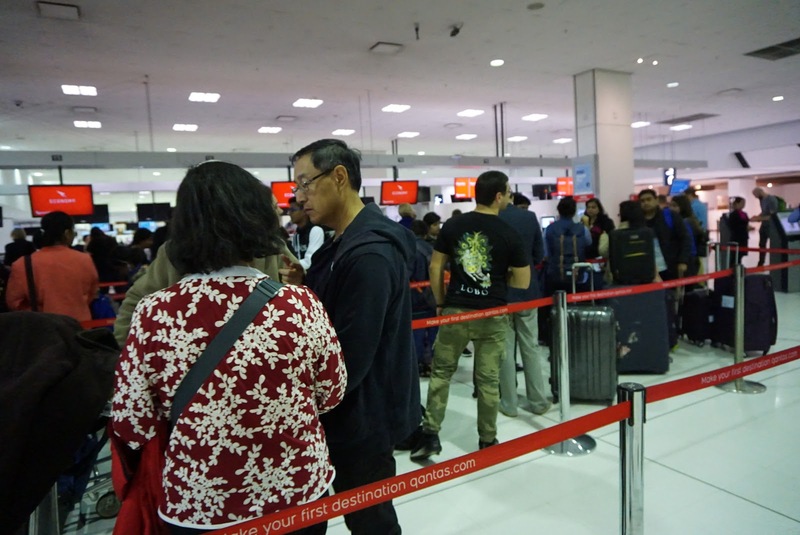 Despite including the meals and check-in baggages, other things such as choosing of seats is chargeable, unlike most other airlines. 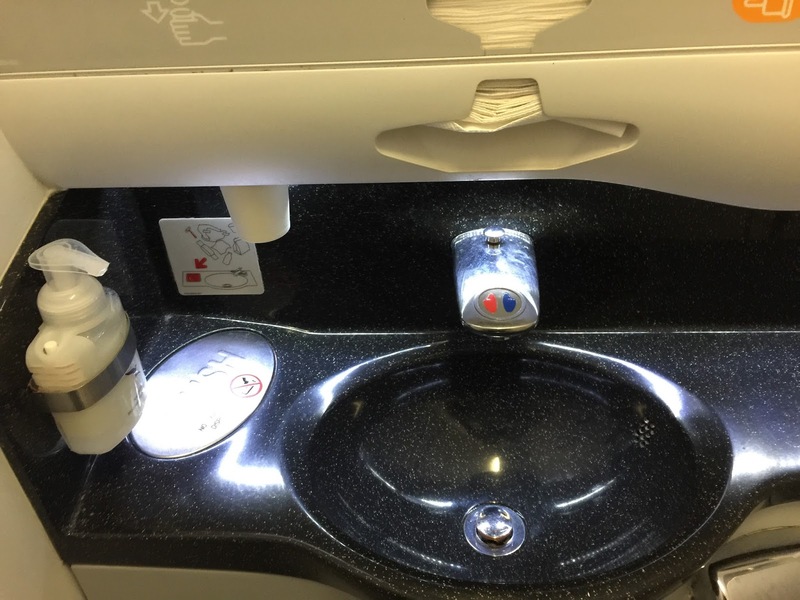 Qantas does not provide any amenities in the lavatory, and not even dental kits or eye shades for overnight flights. 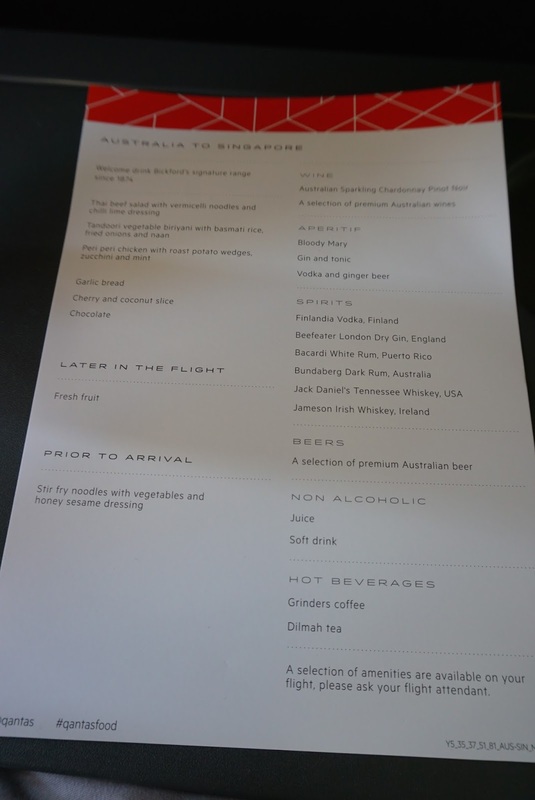 They even charge A$10 for a deck of poker cards, which many other airlines would give out complimentary. 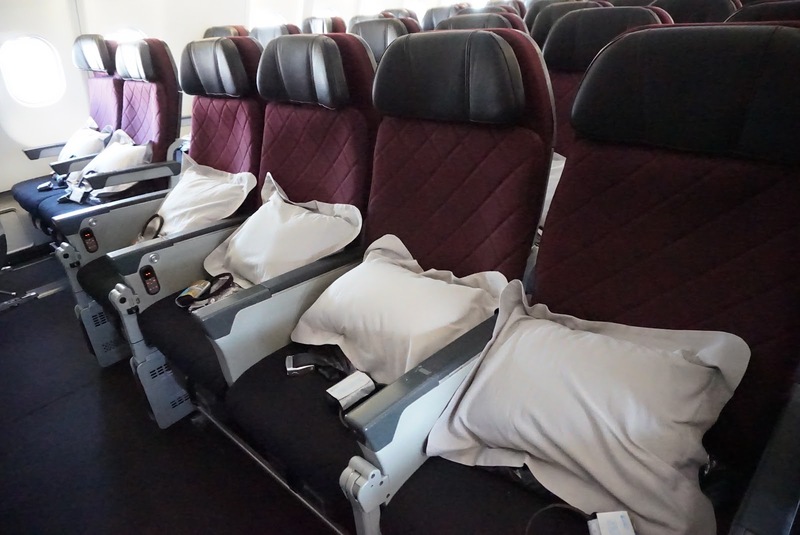 The seats are rather uncomfortable, given me backaches after the 8 hour flight from Singapore to Sydney and back. The food portion is small and tasted mediocre. 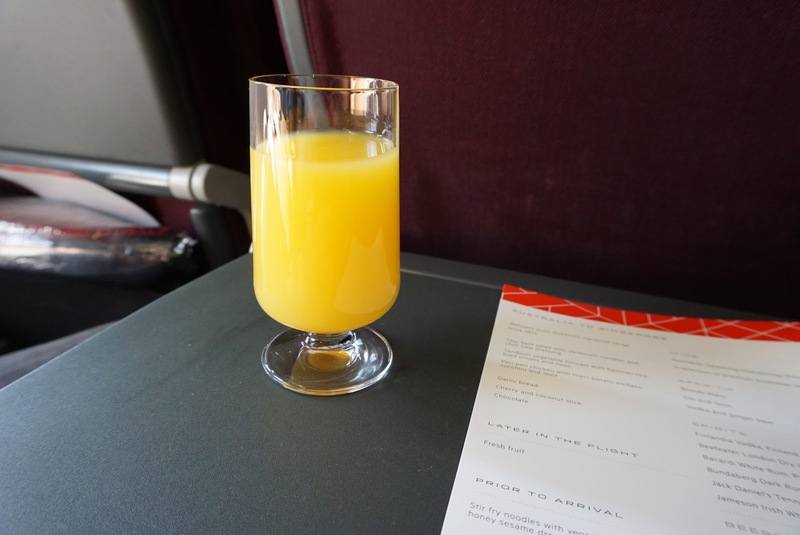 Service is a mix but with more flight attendants whom are friendly, which makes up from the mediocre food and the bad seating. 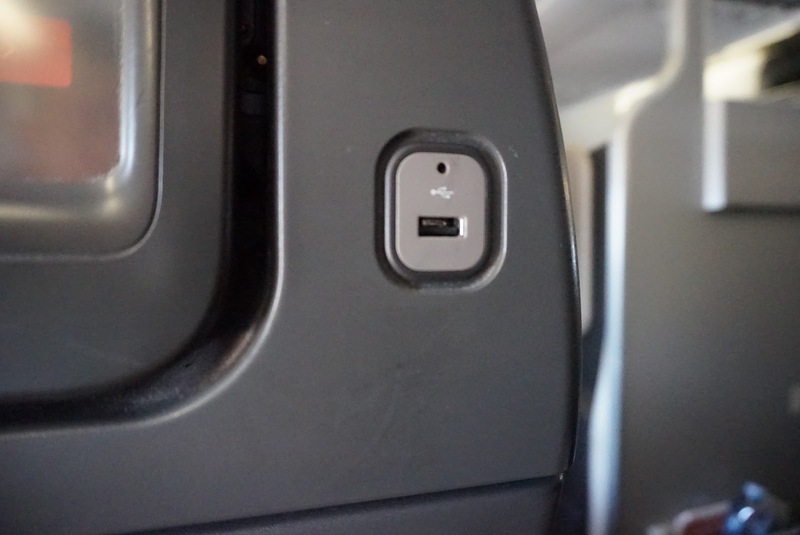 The IFE does the job of keeping passengers occupied with loads of entertainment options. 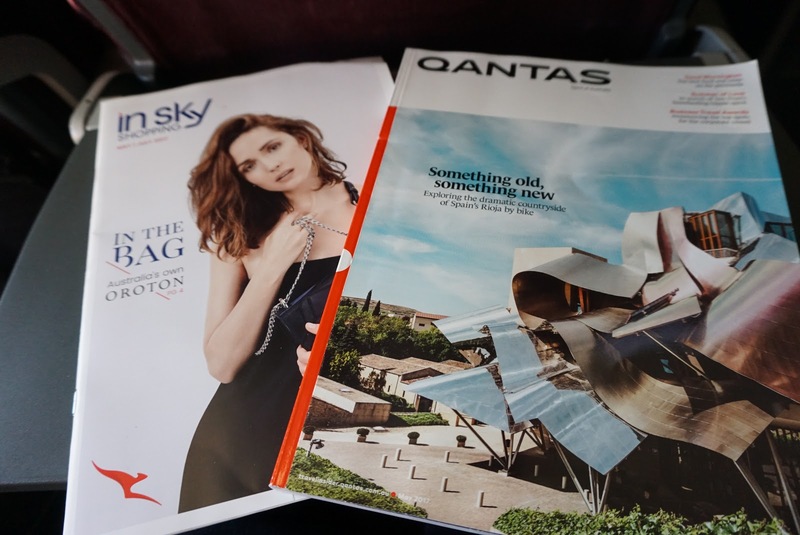 Overall Qantas does the job of bringing passengers from one point to another, but the Economy Class seats are rather uncomfortable to travel in.